Tune in this Wednesday at 6:00pm and hear some classic stories about St. Louis wrestling, all of the legendary wrestlers, Sam Muchnick and Wrestling at the Chase! 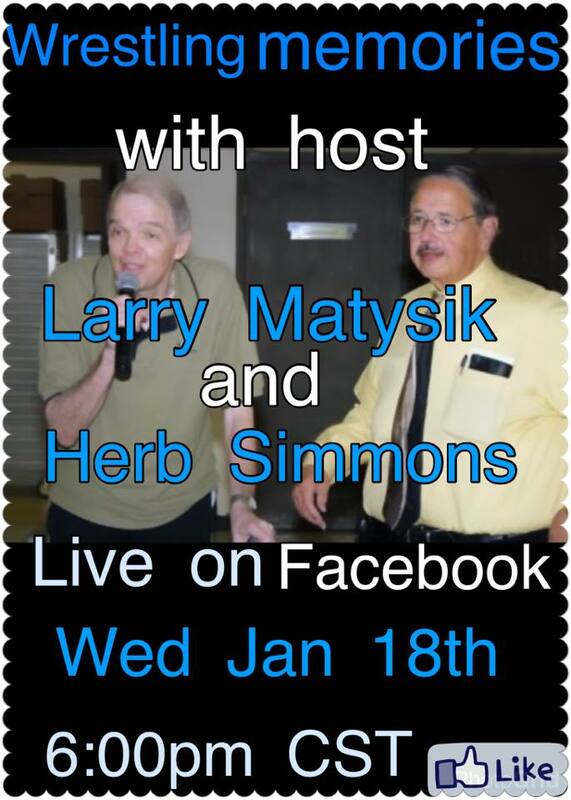 Hosted by legendary WATC announcer Larry Matysik and SICW All Star wrestling Promoter Herb Simmons. Larry and Herb will also be answering questions as well as talking about St Louis wrestling! So tune in and relive the golden era of Pro Wrestling and ask these two icons of the sport a question! Go to Herb Simmons FB page and join on the live broadcast! This entry was posted on January 17, 2017 at 10:05 am	and is filed under Uncategorized. Tagged: Herb Simmons, Larry Matysik, NWA, Sam Muchnick, SICW, Wrestling at the Chase. You can follow any responses to this entry through the RSS 2.0 feed. You can leave a response, or trackback from your own site.